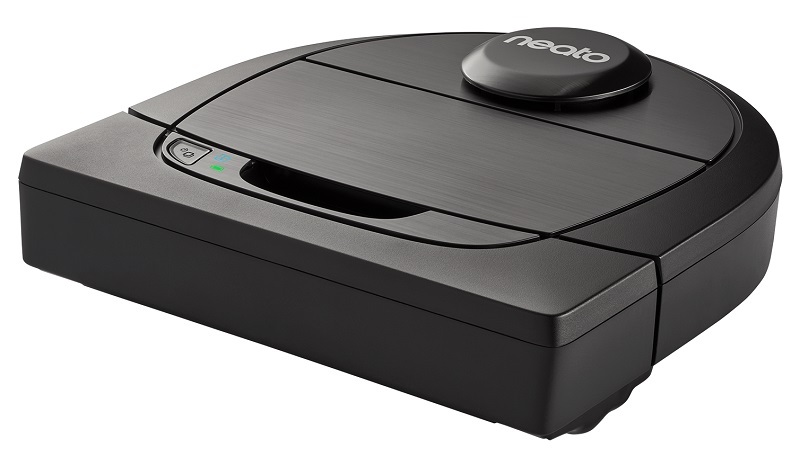 Neato’s oddly-shaped Botvac D6 robotic vacuum might have a bit of tunnel vision, but it’s quite thorough, especially in a house full of dog hair, and has an amazing controller app. As a first-time robot owner, I have to say I was impressed. I didn’t think I’d be the owner of a robot vacuum in this lifetime. When I clean things, I like them to be immaculate — thank my mother for that lesson — and I’ve heard that robot vacuums often have trouble getting into corners or moving along walls. But it seems pigs might be flying, because my colleagues have had their fill of robotic devices for the time being. So I got to be the lucky one reviewing Neato’s little tripping hazard. I was originally supposed to be reviewing the Botvac D4. After I confessed that I had a black dog who regularly sheds, Neato suggested I get a D6, which is supposedly better with hair. I can only take their word for it. 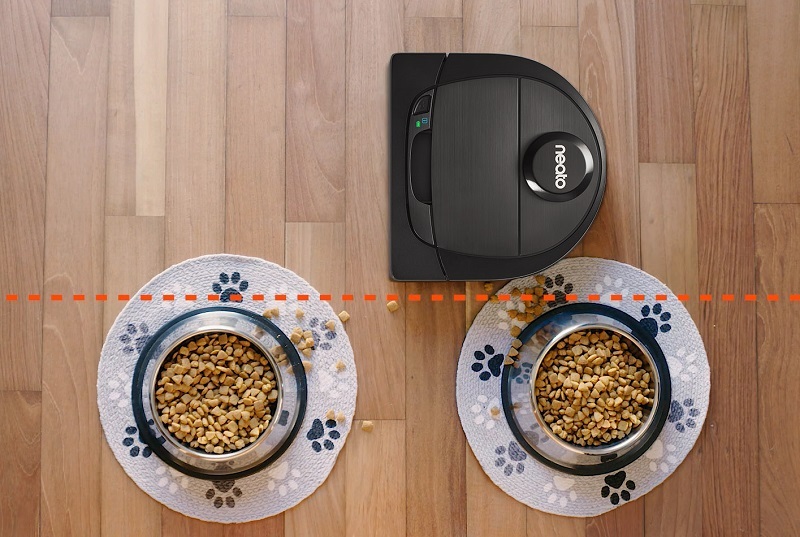 Both vacuums get at least one part of their names from their D shape, a nifty design choice that somewhat mitigates the aforementioned problem of corners and walls. This also means it’s got quite a large brush along the flat side, so it can pick up quite a bit of dirt. 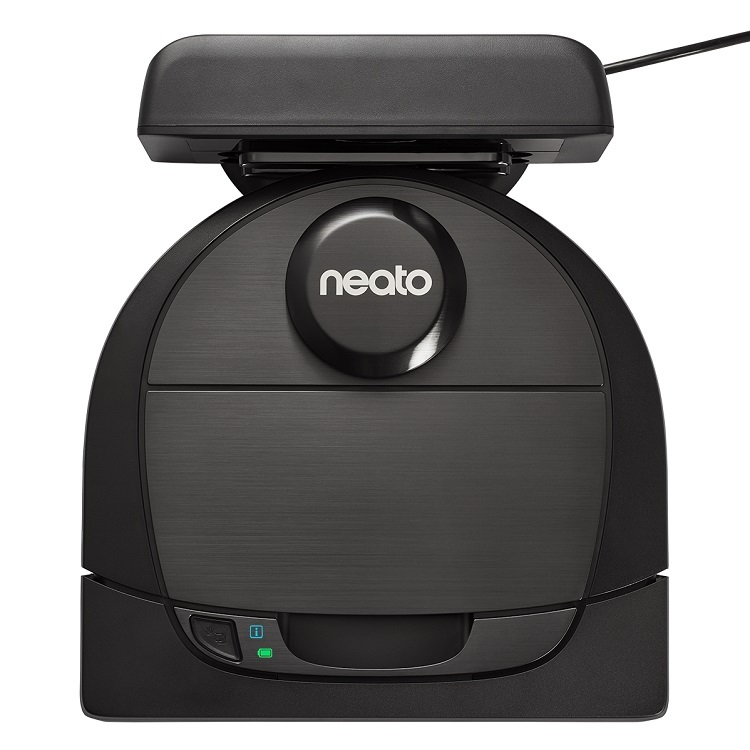 You control the Botvac remotely by way of the Neato app. It’s quite well-designed and easy to use, actually — you can start your bot’s cleaning, pause it, tell it what kind of cleaning to do, and tell it to return to the dock without actually moving yourself. The bot will also send you alerts if there are problems, so you don’t look up after a couple of hours and wonder why everything went so quiet. You can also name your new robot maid in the app. Naturally, having grown up with The Jetsons, I named it Rosie. Admittedly, Rosie threw me some problems during setup. I originally put it in my living room near the front door, but that seemed to interfere with its ability to connect to my Wi-Fi. I spent almost an hour stubbornly trying to register it in the Neato app to no avail. I finally moved it to the hallway, a few feet away from my router, and that seemed to do the trick, even if it did put it in a worse tripping position (the bot extends over a foot away from the dock). Still, I admit I grew attached to it. I’d glance out my door while it was running and call out encouragement. My favorite thing about it is the little wiggle it does when it backs itself into the dock for charging, like it’s settling into a favorite chair. Something you should know about my house before I tell you how Rosie did cleaning-wise: when I say I have a dog who sheds, I don’t mean, “Oh, I find a hair in my soup every now and then.” I mean, “My dog graces our house with black snow on a regular basis.” And if I was going to test this thing properly, I had to see what it could really do. So, for science and for you, my readers, I deliberately didn’t clean my house for a couple of weeks — I know, the sacrifices I make for work. By the time I unleashed Rosie, the corners of each room were so thick with hair it looked like I was sheltering a few dozen litters of chinchillas. Could it actually live up to its manufacturer’s claims of dealing with serious pet hair? And the answer to that is: yes, valiantly. Granted, Rosie’s not going to be fit to tidy the Oval Office any time soon, and I can tell I’ll have to go behind it and do a manual vacuum every so often, but for the normal, “everyday” amount of dog hair, it managed very well. Its 0.7-liter dustbin was a bit small, but again, it did quite well with what it had. Here’s another thing to know about my home: I have several different kinds of carpet in it. Besides the standard low pile in most rooms, I have a few area rugs I use to cover up the bare tacks on the sides of the floor, and one very large, dense shag rug my mom bought to put under the coffee table. I also have a very old dining room table that has a low footboard under it. It’s a veritable gauntlet for the likes of Rosie. Yes, I know, I’m in dire need of a Queer Eye makeover. Don’t @ me. And credit to the Botvac — it did its best to navigate everything. It managed to sort of waddle over the area rugs, got as far under the dining table as it could, and even managed to haul itself over the edge of the shag rug. It found its limit there, though. Pretty soon I was getting politely frantic alerts from the Neato app pleading for me to come and help. So overall, Rosie did better than I expected. It only has two major design flaws, to my mind. First, it’s noisy. Rosie was only slightly quieter than my Shark upright, which tends to sound like a dozen servers starting up at once. Second, it tends to get its brush clogged quite a bit — understandable, given it was dealing with my dog’s black snow and my long tresses — which I presume is why Neato included a brush-cleaning comb. I think it bears repeating just how great the Neato app is to use. It’s got a great layout and very clear buttons for controlling the Botvac. It’s a dream to set up, and the personalized notifications it sent me from Rosie were very charming. The app also saves a floor plan of your home after the Botvac has done a special mapping run. This will allow you to section off parts of your home, creating invisible walls past which your bot will not go. The bot also comes with a few feet of magnetic strips, if you need to section off part of the house manually. Left to its own devices, the Botvac seems to want to get as far into each space as it can. It’s got a setting that will make it more cautious about bumping into things, but that seems to just make it avoid corners, which seems to defeat the purpose of its D-shape. The Botvac occasionally had trouble figuring out room size. Rosie spent almost an hour mapping the hallway, in which it’d been docked, to perfection, but seemed to choke somewhat when it came to the rest of the house. She failed to detect or pass through open doors during the first few cleanings, meaning my bathroom went completely un-vacuumed. The pic above was the result of its first attempt to clean. My house definitely doesn’t look like that. Granted, this was after it got stuck on the shag carpet, but subsequent cleans only yielded a bigger map by increments. Basically, the Botvac will clean well, but don’t expect it to do so perfectly the first time. Overall, I was impressed with my new robot friend. It’s a touch on the expensive side, at around $700, but it put in a much better performance as a cleaner than I expected. I’m still going to go back and give every room a second clean of my own, but if you’re not weird like me, you’ll probably find its vacuum capabilities quite adequate.